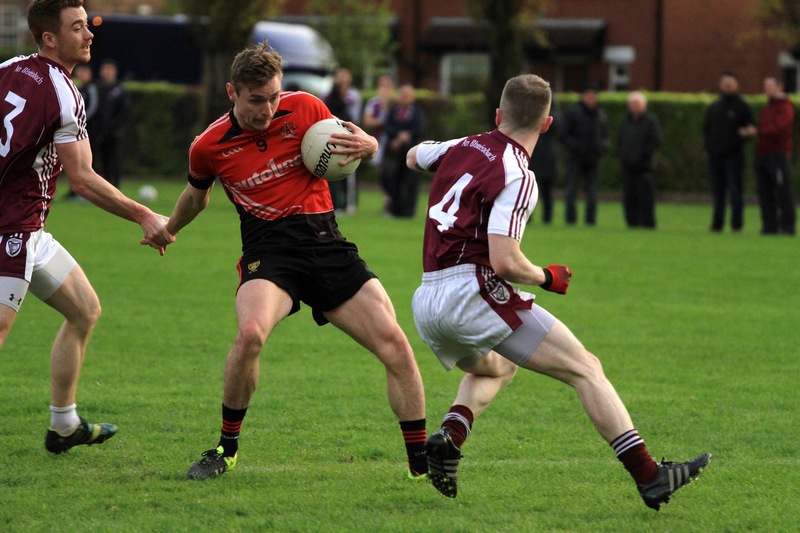 Caolan Mooney was in devastating form with his ten points helping Rostrevor to a relatively straightforward victory over Bredagh in South Belfast on Friday evening. The Reds visited Cherryvale on the back of three successive wins and it was soon to be four, as they controlled the contest for long periods with John Fegan’s 33rd minute goal putting the gloss on the win. Indeed, the Ravenhill Road side will have been dismayed after great wins in their previous two outings against RGU Downpatrick and Loughinisland had carried them into this game with the opportunity to overtake Rostrevor in the league standings; an opportunity spurned. This encounter was billed as an extremely troublesome fixture for the seasiders with the city side having proved to be difficult opponents for each of the other title contenders in their earlier games. Despite this, Rostrevor made the ninety-mile round trip in high spirits and started well. Caolan Mooney’s direct running allowed for the Reds’ ace to slot over the opening score and; whilst the lively Alan Davidson replied with a free, further points from Mooney, Damian Magee and Piaras Kane at the end of a sweeping passage of play allowed Rostrevor to open up a three-point lead by the 6th minute; 0-4 to 0-1. Davidson was proving to be Bredagh’s main scoring threat and his movement was going to be key for the Belfast men to be competitive, as the match progressed. 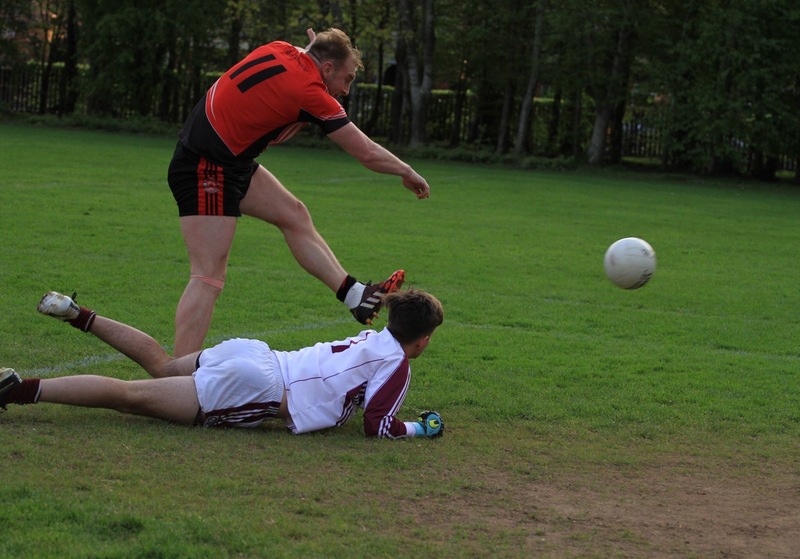 His second point on 8 minutes did provide momentary respite, but the blistering form of Caolan Mooney was soon to open up a commanding Rostrevor lead with five unanswered scores coming from his right boot. The first two of these were excellent efforts from range in a fruitful 11th minute with a brace of points from the dead ball; in the 20th and 22nd minutes, stretching the lead further. A point from the right side extended the lead to seven points by the 25th minute with Kevin Dornan’s response providing an increasingly seldom high point for the hosts. Mooney tagged on his eighth point with another well-taken free, but Dornan’s second of the evening ensured that Bredagh were still in with a fighting chance entering the second-half; albeit a fading prospect. The onus was on the city side to bring themselves back into the match at the start of the second period, but the revival never materialised with Rostrevor ending the match; as a contest, within three minutes of the restart. Mooney’s free pushed the Reds into a seven-point lead once more in the 32nd minute, but the following attack proved to be fatal for Bredagh. The failure of the men in Maroon to clear their defensive lines from the resulting kick out presented the easiest of opportunities for John Fegan to score the game’s only goal from close range. The game was up and Bredagh’s recent good form was about to come to an end with the remainder of the match being played at a relatively pedestrian pace. It must be said though, that Bredagh’s performance did improve in the closing quarter of the contest but unfortunately; from their perspective, it is always much too late in these circumstances. Brian Rice drilled over a response with Alan Davidson sending a good point between the posts to narrow the gap, but the hosts never looked like coming back to the extent at which they would worry Rostrevor. Caolan Mooney’s tenth point and a fisted effort from Damian Magee; after a surging run from Micheal Mackin, restored the Reds’ ten-point lead entering the final ten minutes. The Reds actually failed to raise a flag beyond the 48th minute of the game, but Bredagh’s Alan Davidson was the only player to do so with his two points; in a tame finale to the encounter, leaving the men from the capital at the wrong end of an eight-point defeat. So, another positive step for Rostrevor in their chase for promotion back to the top flight and their season continues with the visit of Carryduff to Pettit Park on Monday evening. Bredagh will hope to get back on track with a visit to Fontenoy Park and the recently struggling Liatroim. ← Awe-inspiring display by the U17 girls!